Vincent was in Children's Hospital from March 21st thru the 28th for a Tracheotomy. This is the creation of a surgical opening through the lower neck and trachea to make breathing easier for him. He was having extreme difficulty breathing. Vincent's surgery was performed on March 21, 2006 and lasted about 2.5 hours. It was 5 hours from when they took Vincent for his surgery before we could see him. Trach patients are kept in ICU for a minimum of 3 to 5 days, depending on how they do. Hospital policy states that we could only visit for 15 minutes at a time as well as we could not sleep in his room. This would not do for us as we are very hands on and could not stand to be away from Vincent for any length of time, much less over night. This is where fate stepped in. When we were finally allowed to see Vincent, the reality of the decision we had made hit us straight between the eyes, a large tube protruding from his neck where a hole was created. We knew in theory what this operation was for, but until we saw little Vincent, we realized how intense an operation it was and is. Once in his room we were told of the rules, and we asked politely if we could remain longer than rules allowed and promised we would be out of the way. We were lucky, his nurse allowed us to remain until 10:00 PM (visiting ends at 10:00pm). While this was nice, we wanted more, we actually wanted to remain in his room at all times. This is where fate came in. Earlier that day a small child was left with his grandparents to watch over, he was named Aiden and he was 11 months old. Well, this little boy got lost and by the time his grandparents found him, he was face down in the family swimming pool. Aiden was rushed to the Hospital and was placed in the adjoining room next to Vincent. His case was so severe that it took almost all of the Hospital efforts to watch over him. He constantly needed emergency services and while all of this was going on, the nurses decided to allow us to stay with Vincent at all times, including the nights. We heard as the parents arrived to see their little boy almost lifeless on a hospital bed. The screams and tears penetrated our souls as they could not understand how their little boy had befallen such an intense tragic event. The crisis group assembled to try and provide support for the parents (a young couple) and at the same time, try to keep their problem a private one. Were it not for the evening news, which reported the drowning, we probably wouldn't have known what had happened to this little boy. So, here we are, able to spend all of the time we needed with Vincent because of the situation next door. We were immediately immersed into the training on how to care for Vincent. while our hearts poured out to the family next door, we were facing our own battles. The day after his surgery Vincent faced an emergency of his own. While a nurse was trying to suction his trach tube, his tube got blocked. Suddenly Vincent's stats started to fail, she screamed out for help and before long, there were at least 8 people in the room providing emergency services for my son. The idea of removing the trach tube and replacing it with another was not an option as the initial tube was sutured right to his neck. In the end, they had to pour some saline down the tube to break down the blockage. This finally allowed them to remove the blockage and within a second or two. his stats were back up. Eventually we were moved out of Intensive Care and we remained at the hospital for a few more days. As a requiste of this operation, Dora and I had to attend a CPR class where we were instructed on how to perform CPR on a child with a Trach. Once we completed this course and were able to demonstrate that we could remove and reinsert Vincent's Trachea tube, we would be cleared to take Vincent home, which we did complete. If you are wondering about little Aiden, unfortunately they were unable to help him as just before moving Vincent out of ICU, little Aiden finally passed on. Our thoughts and prayers are with his family. The days that followed were difficult in the beginning as Vincent required a lot of suctioning. As a result of his new operation, we now needed to have additional equipment at his side al all times. This includes a Humidifier, a Portable Suction Machine, emergency spare trachea tube and a whole lot of trachea cleaning supplies. When a child or adult receive a tracheotomy, the body will excrete a lot of mucus through the tube as it gets used to the tube in the airway. A friend of mine whose wife also received a tracheotomy told me that she describes it as a permanent tickle in the back of your throat. In the latter months of 2004, Vincent began to develop serious problems with acid reflux. As a result of his reflux problem, Vincent was having trouble swallowing his food and medications as his aspiration was becoming more and more serious. This problem was causing Vincent to gag a lot and eventually he would vomit out most, if not all, of his feedings and also his medications. A visit to his doctor left us with no choice but to consider a Nissen Fundoplication operation along with the insertion of a G-tube whereby he would now be fed by a feeding tube. The Nissen Fundoplication would help to minimize his problem with Acid reflux and the G-tube would make his feedings a whole lot easier not to mention providing an easier way to give him his medications. This operation would not prohibit us from oral feeding, but it was also recommended that the majority of the feedings be supplied via the new G-Tube. Believe it or not, this would be Vincent's very first serious operation and we were pretty scared. It would be the first time that he would be under anesthesia. There was no way of knowing whether or not he would or could have a seizure during this operation, which of course made the decision a whole lot harder. Additionally, the fear of how Vincent's little body would react to the anesthesia was also unknown. In the end though, we had to have that very same faith that allowed us to overcome his initial condition to provide us with the hope and confidence that everything would be fine and this was the best thing for him. The operation itself took no longer than 2 to 4 hours, but it seemed like eternity to us. The thought that we were not there with him really left us feeling pretty hopeless. The waiting room began to close in on us as parent after parent was being visited by the physician working on thier child, and still we did not see our physician. Finally, they called for Vincent's parents, and here we were, ready to see how our son was. The news was both positive and surprising too as it was discovered during the operation that his spleen was attached to his stomach wall. This caused the operation to take a little longer. We were assured that all was well and off we went to see Vincent. When we finally saw our son, he was still in recovery and I remember that as soon as he heard our voices, a tear came out of his eyes and rolled down his cheek. It was overwhelming to know that he knew his parents voices even in his groggy state. We were teary eyed. From here we took Vincent to his own room and remained at the Hospital for 4 more days until he was released. One final note, Vincent spent Easter of 2004 in Childrens Hospital in Fresno, CA and his positive outcome was the best result that Easter could have delivered. It has been a couple of years now and this was one of the best decisions we ever made. He is a lot heavier and healthier as a result of this operation. Anyone considering these types of surgeries should discuss all options with their physicians. There is a lot of home care to be done and that must always be considered. Finally out of ICU, wouldn't you smile? Here I am with Children's Hospital mascot, George......Hi! As a result of Vincent's growth and minimal control of siezures via medication, we were introduced to a procedure called VNS, Vagal or Vegas Nerve Stimulation. 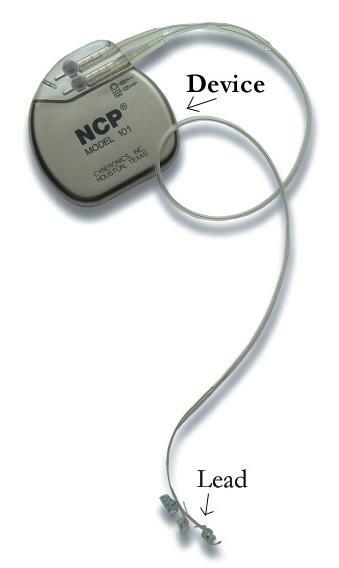 The insertion of a small device called a Pulse Generator (similar to a pacemaker in size) in the upper left shoulder which is designed to deliver electrical signals to the vagal nerve for the purpose of reducing his seizures. 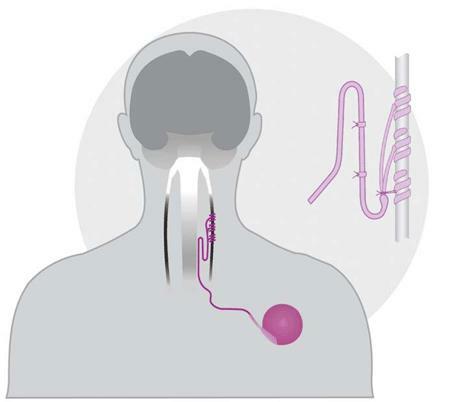 This device uses two leads which are connected to the Vagas nerve deep within the neck between the aorta and the jugular. Vincent underwent this surgery on June the 7th, 2007 at Children's Hospital in Fresno, CA. He remained in the hospital for one night. Since the insertion of the device, it has been programmed twice. We began with a very low setting and are not expecting to see results until after a few months. This device includes a separate magnet which we use to swipe over the unit when we feel Vincent may be preparing for a seizure (to prevent it) and during a strong seizure to try to force it to stop. While we are not sure if it is actually working yet, we are very optimistic. Treating seizures is not the only use for this device, but that is what it is being used for with Vincent. Below are the pictures of his most recent operation. We will contunue to add information as time goes by to let you know how Vincent is doing with this device. re to add your teVincent and Momxt. Click heHow it is installed and device pictures.